Costs $100 with $70 back in rewards points and $10 cashback from Discover so about $20 total. Score! Action Shot! This is the tv I bought years ago. Its a 32" so perfect for this smaller stand. It's been sitting on the floor facing the wall for almost a year and it was finally time to remove it from time out! Check out my brother's old SNES and Sega he just gave us. Unfortunately the Sega plug seems to be MIA so no Sonic for us. He also gave us a bunch of games I'm going to throw on eBay for $3. No one wants to play baseball with players from 1998. No cable and no blu-ray player up here but we'll probably hook up my old antenna, if only to give it a place to be. Nothing but the vintage best for our guests! Fancy! Not as a nice as a Kosta sticker but nice. It even came with an installation video! I didn't need to watch it because installation was straightforward and the instructions were actually legible. Assembly took about twenty minutes, including unboxing and going from the second floor to the basement for a screwdriver. 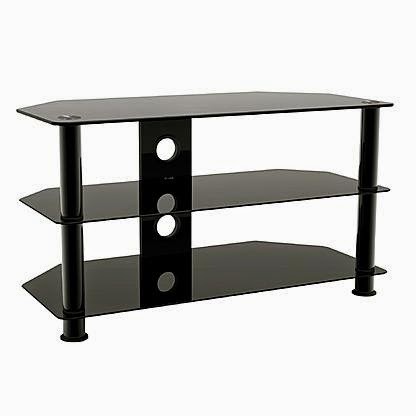 In contrast, this is the first floor tv stand (purchased at Target) and it took hours to assemble between two people. There was a 1-800 number and when I called with questions about a screw (for my super mainstream Sony tv) they told me to go to Home Depot. Although to see everything I would recommend a search on http://slickdeals.net/. I know KMart has similar deals on the same stands but couldn't find a linkable page with them all.